Ulysses Glove Project: The Next Thing. . . At Last. The Next Thing. . . At Last. but when I thought them through, they dissolved. I was frustrated. All through the process of thinking thinking, as Pooh would say, I kept drawing and stitching. I have come to love doing small embroideries of mostly words. 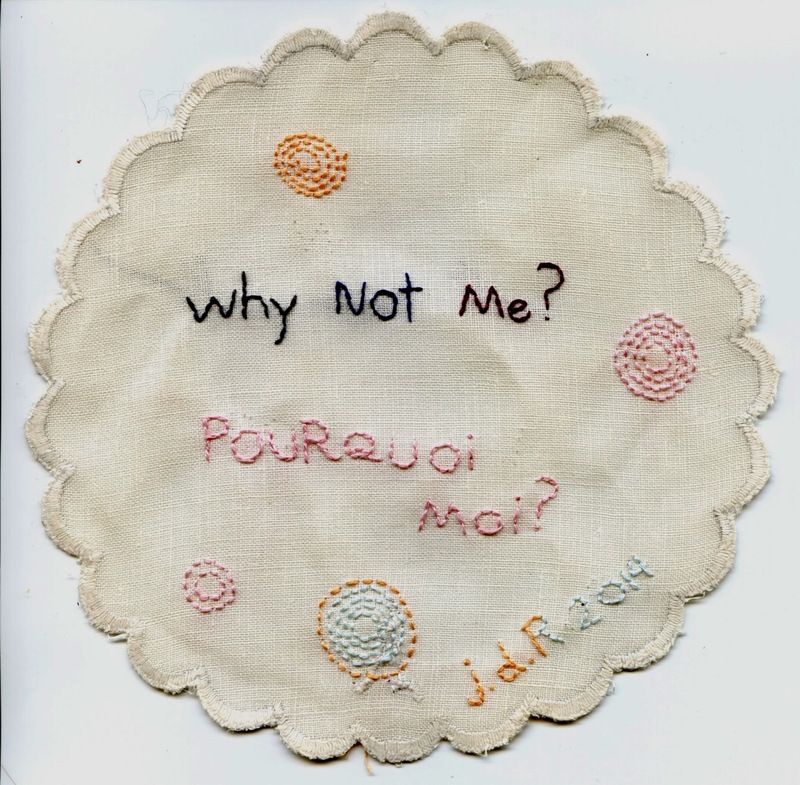 There is something liberating about stitching a word on cloth, rather than writing it. It's almost childlike...learning to write in a new medium. I hoped I could come up with an idea that incorporated stitching. More important, I wanted this project to be about my mother, as the Ulysses Gloves were about my father. My mother is alive, but her mind is so debilitated now, that I can work on something to do with her without her caring a whit about it. I knew she had notebooks. I brought them home with me. 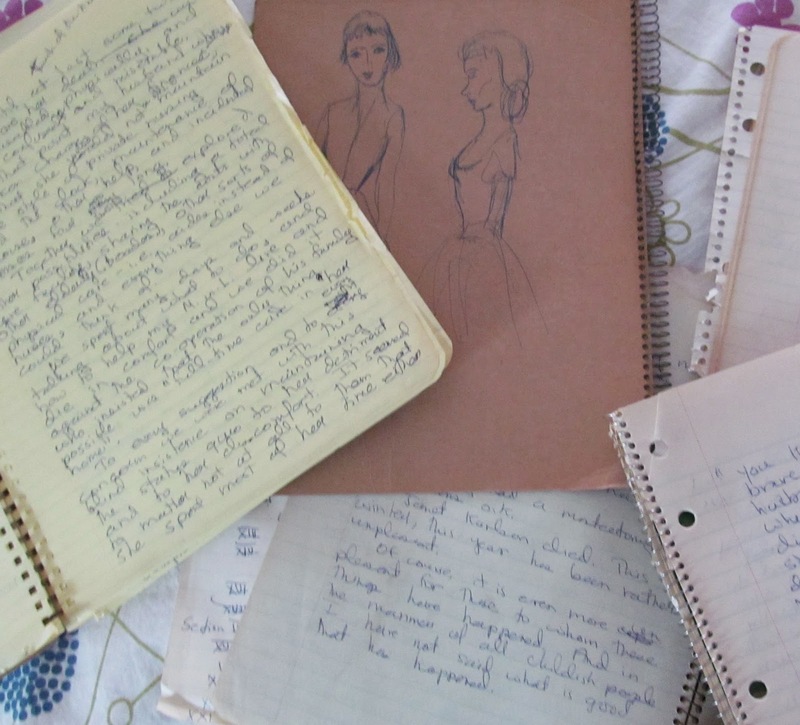 They are filled with short stories (the beginnings...she never followed through), diary entries, and lists. 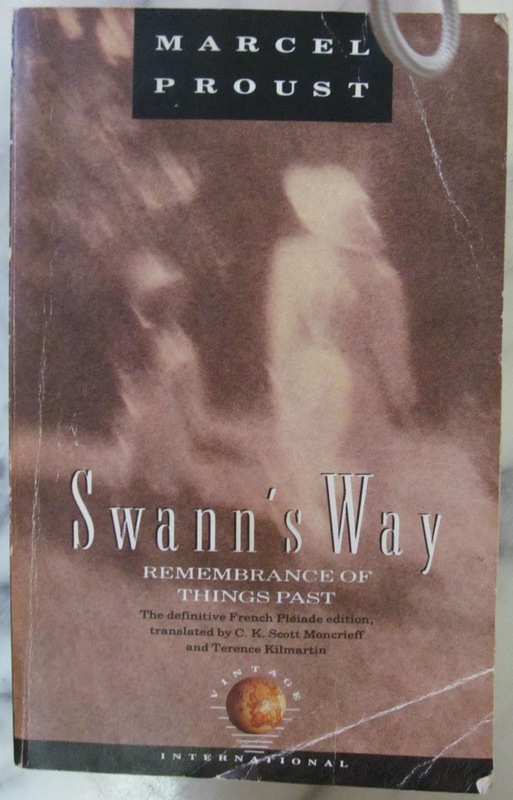 Some of the covers have sketches of the female figure she drew again and again and again. In one week I'll be at the Virginia Center for Creative Arts, for ten days. I can work and work, with no day job, dog walking, carpooling. I am bringing her notebooks and I'll edit them so that there is some order to them. And then, I shall stitch her words. At first I didn't know what cloth I would use for the embroidery. Not the small handkerchiefs or doilies I've been using for my current pieces. 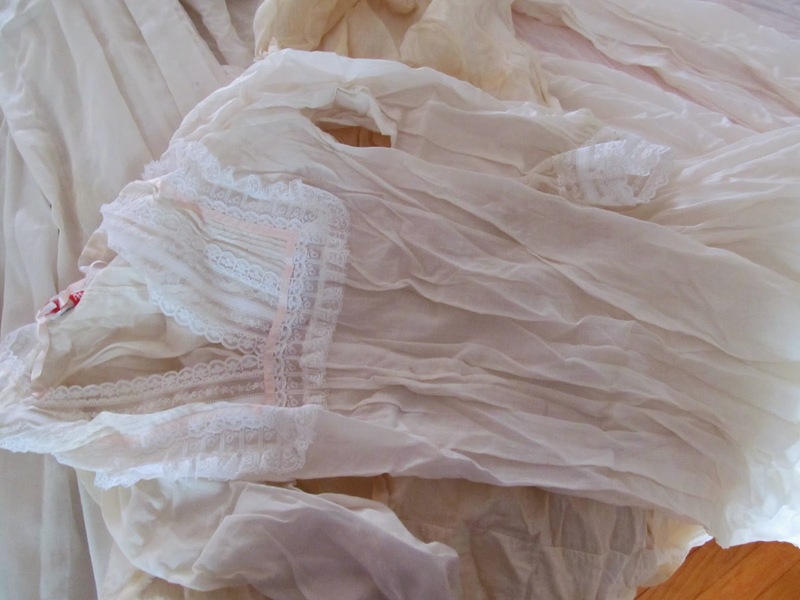 One night I remembered I had a box of her nightgowns, from when she was a young married woman. I thought I knew where they were and I ran to see if my memory was true. They were there. And now I have my project. 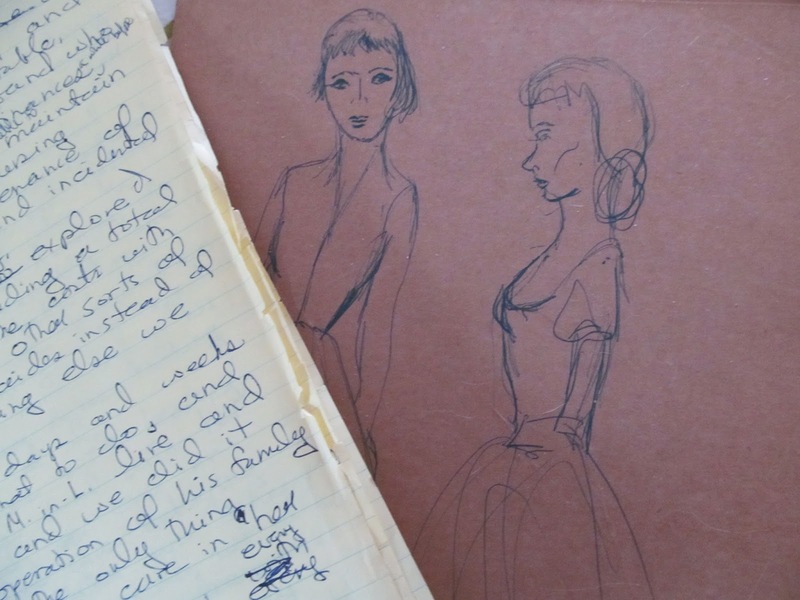 To stitch her words, onto the clothes she wore when she was young, and had a life ahead of her. Her stories, her night clothes. The gowns she wore when she dreamed. In a perfect world these would be an a room that would also include paintings I make of her room now, including the dresser covered with pill bottles, cigarette ashes, books, envelopes, and New Yorker magazines. There would be a carpet with a flower design, because though she is an epic slob she always loved any textile with flowers. There would be a bookcase with multiple copies of Proust, which she read again and again and again. I don't have the art career to get that kind of real estate. But I'll start editing, and stitching. I expect that part alone will take me two or three years. Maybe by then someone will want to help me realize this vision I have. I don't know if my mother will still be alive. But I know that this is the project I want to do, and even if she can't appreciate it, it will do her proud.